September 17, 2014. 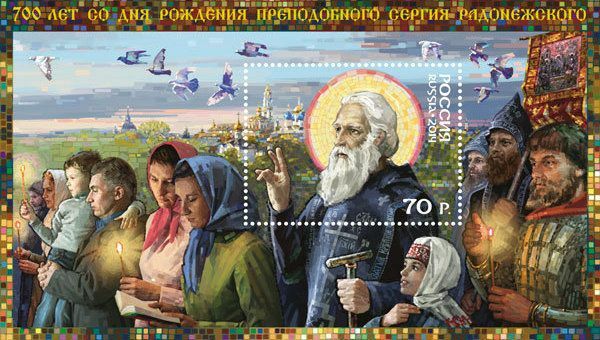 A set of envelopes with a stamp dedicated to the 700th anniversary of St. Sergius' birth (1314-1392) was released on September 16. The official website of the Russian Post reports that this stamp represents a religious procession headed by the Venerable Sergius of Radonezh with the Holy Trinity-St. Sergius Lavra in the background and a flock of pigeons in the sky, which symbolize the followers and disciples of St. Sergius. There are historical figures in the picture (from left to right): the Grand Prince Dmitry Donskoy, the legendary monk and warrior Alexander Peresvet, and also contemporary Orthodox Christians, who are carrying lighted candles. These colorful envelope sets are available at the Moscow post office #101000 (Myasnitskaya st., 26 building) during the first three working days starting from the day of issue. There people will be able to mark the stamps with a special postmark. The total number of the issued products is 85,000 copies. A decorative cover has been prepared for release, which includes the envelope set and the envelopes with marked stamps of the first day (Sergiyev Posad in the Moscow region).